Nursemaid oligodendrocytes care for neuronal axons not only by wrapping them in insulating myelin, but also by feeding them lactate, according to two papers in Nature. This is a fairly newfound function for these cells long considered to be insulators only, with the nourishing role thought to be the province of other glia such as astrocytes. As reported online July 11 by Jeffrey Rothstein and colleagues at Johns Hopkins University in Baltimore, Maryland, oligodendrocytes use the monocarboxylate transporter 1 (MCT1) to exude lactate that axons can take up and use for energy. The paper follows on the heels of another Nature study from Klaus-Armin Nave’s group at the Max Planck Institute of Experimental Medicine in Gottingen, Germany. In the April 29 issue, Nave and colleagues reported on direct measurements of lactate secreted by oligodendrocytes; the metabolite appears to be quickly ingested by the enwrapped axons. Deficiencies in this lactate shuttling could contribute to neurodegeneration, Nave suggested. Supporting this idea, the Rothstein team showed that the motor cortices of people who had ALS had half as much MCT1 as do people without motor neuron disease. With all that glycolysis, the oligodendrocytes should quickly build up lactate and pyruvate. Using magnetic resonance spectroscopy of the brains of anesthetized mice, the researchers, including joint first authors Don Mahad of Newcastle University in the U.K. and Susann Boretius of the Max Planck Institute of Biophysical Chemistry in Gottingen, discovered that the mutant animals produced high amounts of lactate, compared to wild-type mice, in the cortex and corpus callosum. Notably, the lactate only appeared under anesthesia, which blocks respiration throughout the body. After anesthesia, the excess lactate quickly dissipated. Because of this, Nave theorized that axons quickly took in the lactate. If this happens in COX-10 mutant mice, then there might also be a mechanism to transfer lactate from oligodendrocytes to axons in healthy animals, he suggested. Rothstein’s study, conducted by joint first authors Youngjin Lee and Brett Morrison and colleagues, offers up the transfer mechanism. The lactate transporter MCT1 was previously thought to localize to astrocytes, but the researchers used mice with a fluorescent reporter to show that MCT1 is almost exclusive to oligodendrocytes, with occasional expression in neurons as well. Thus, MCT1 is ideally positioned to transfer lactate to energy-hungry axons. In several experiments, the team showed that MCT1 in oligodendrocytes is required for neuron viability. They treated wild-type mouse spinal slice cultures with MCT1 inhibitors and observed that one-third of the neurons died. To focally downregulate the transporter in mice, the researchers injected a lentivirus toting an RNA into the spinal cord to block MCT1 expression. 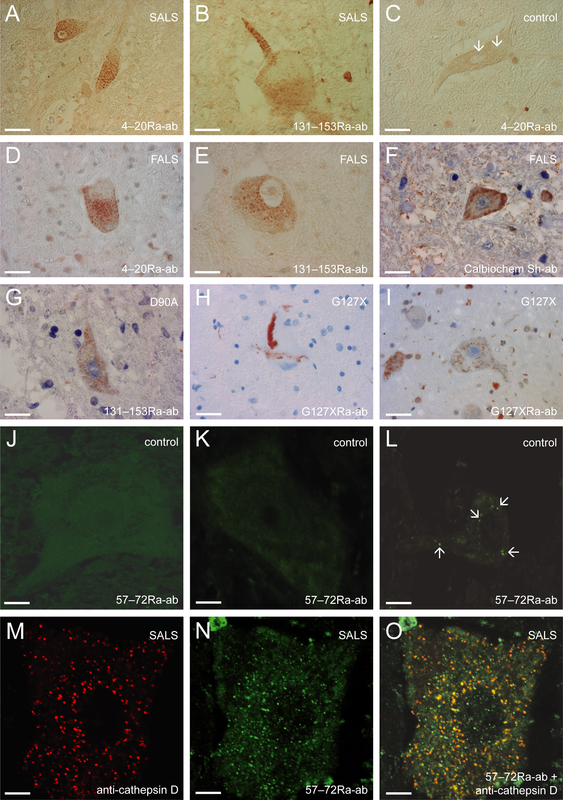 Compared to mock injection, nearly half of the local motor neurons died, and many suffered axonal swelling and degeneration typical of neurodegenerative disease. The researchers also bred mice heterozygous for wild-type MCT1 and a null allele, which make half the normal amount of the transporter. These animals exhibited axon swelling similar to that in people with ALS, as well as to mouse models of the disease. In further experiments, Lee and Morrison linked MCT1 directly to ALS, showing via immunoblots that the motor cortices from people who had ALS have less than half as much MCT1 protein as do cortices from individuals without ALS. Using fluorescence microscopy, they also confirmed that ALS model mice expressing mutant superoxide dismutase 1 (SOD1) had normal oligodendrocyte populations but made less MCT1 in the ventral horn. Together, the Nature papers conclude that oligodendrocytes feed axons lactate and that this is essential to maintain neurons. A similar support system likely exists between Schwann cells and peripheral axons, Nave suggested, although it might involve different transporters and metabolites. “In hindsight, I think it makes a lot of sense, because the axon itself is so remote from the cell body,” said Dwight Bergles of Johns Hopkins, who sometimes collaborates with Rothstein but is not an author on the current paper. An axon may require more energy supplies than are able to travel its length, Bergles said. Moreover, the hydrophobic myelin sheath prevents axons from accessing any extracellular source of nutrients—except the oligodendrocytes themselves. This energy loss might explain the typical axon swelling seen in neurodegeneration, Nave added. Axonal transport requires ATP, and if energy is in short supply, traffic could build up, inflating the axon, he suggested. Lactate deficiency could be one mechanism by which axons run out of energy. “I think part of what causes degeneration of motor neurons [in ALS] is lack of energy support from oligodendrocytes,” Morrison said. “You are basically starving the axon of energy.” It is far too early, he added, to know how the MCT1 reduction is caused or how it fits in with other aspects of ALS pathology. He hopes MCT1 will turn out to be an important factor in disease progression, making it a potential therapeutic target. Bergles and Rothstein have also shown that oligodendrocytes proliferate in mSOD1 mice, but are malformed, further supporting the hypothesis that these glia are involved in the disease (see ARF related news story on Kang et al., 2010). The proof would be if replacing oligodendrocytes or upregulating MCT1 in ALS model animals extended lifespan, Morrison said. Nave, for his part, is experimenting with lactate and other metabolites that might support axon health. “The field is starting to embrace the idea that oligodendrocytes are like astrocytes in that they support neurons,” said Craig Atwood of the University of Wisconsin, Madison, who was not involved in the study. He was also pleased to see some attention to lactate metabolism in ALS; Atwood has proposed that lactate shuttling at the neuromuscular junction may also contribute to the disease (Vadakkadath Meethal and Atwood, 2010). “I think they are on the right track,” he said. Lee Y, Morrison BM, Li Y, Lengacher S, Farah MH, Hoffman PN, Liu Y, Tsingalia A, Jin L, Zhang PW, Pellerin L, Magistretti PJ, Rothstein JD. Oligodendrocyte metabolically support axons and contribute to neurodegeneration. Nature. 2012 Jul 26;487(7408):443-8. [Pubmed]. Funfschilling U, Supplie LM, Mahad D, Boretius S, Saab AS, Edgar J, Brinkmann BG, Kassmann CM, Tzvetanova ID, Mobius W, Diaz F, Meijer D, Suter U, Hamprecht B, Sereda MW, Moraes CT, Frahm J, Goebbels S, Nave KA. Glycolytic oligodendrocytes maintain myelin and long-term axonal integrity. Nature. 2012 May 24;485(7399):517-21. [PubMed].